Type Charm(s). Charm Type Dangle. UPC Does not apply. Charm Type Slide/Slider. Charm Type Dangle. UPC Does not apply. Color Silver. Type de Breloque:Individuel. Première Couleur:Argent Antique. Plus D'Infos. Quels que soient vos besoins en joaillerie, Charming Beads a ce qu'il vous faut! Lorsque vous choisissez votre fil, il est important d'opter pour la bonne épaisseur et la bonne taille. Première Couleur:Steampunk Bronze Antique. Type de Breloque:Individuel. Nos apprêts ne contiennent ni plomb, ni cadmium, ni nickel. Plus D'Infos. Quels que soient vos besoins en joaillerie, Charming Beads a ce qu'il vous faut! Main Stone No Stone. Type Charm(s). Charm Type Dangle. UPC Does not apply. Charm Type Dangle. UPC Does not apply. Color Green. Charm Type Oversized. Charm Type Slide/Slider. Charm Type Dangle. UPC Does not apply. Alliage de zinc-Plomb et nickel libres. Perles plaqués argent sont faites pour s’adapter à tous les bracelets de style Pandora et Troll de Biagi, Chamilia. ♥♥♥ Sur les perles ♥♥♥. STYLE: Chinese Dragon Dance Charm, pendant. 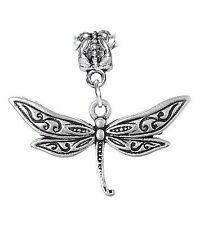 Perfect charm for necklace pendant or bracelet. Antiqued silver, bronze, gold: alloy. -Assorted sizes: From 16mm to 1.2". 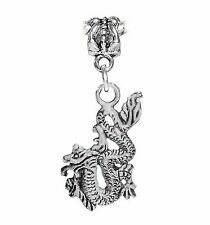 This beautiful dragon charm is perfect for jewelry and crafts. It features a silhouette design with a smooth finish. Size: 18mm x 16mm. Item number : ZY235. 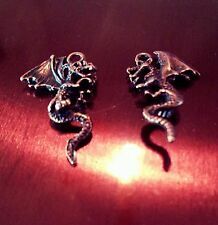 Size: total length approx 24mm, dragon size:12mm 8mm. Colour: Dark Silver Finish. Item number : ZY240. Size: total length approx 27mm, dragon size:16mm 11mm. Colour: Dark Silver Finish. I have a lots of Pandora beads. Color：Antique Bronze. I’m sure everything could be solved by communication. This charm with a Lobster Clasp FITS Charm Bracelets, Necklace, Purses, Zippers, Pet Collars, etc. Clip on Lobster Clasp – Stainless Steel. Choice of Bail or Clasp. MIX & MATCH any charms that you see listed for your own PERSONAL Charm Bracelet! Charm Bracelet Antique Brass Silver Snitch Lighting Dragon Lord Voldemort Deathly Horcrux Charms Bracelets Gift. Shape\pattern: Round. Setting Type: Bezel Setting. Model Number: 164. Clasp Type: Lobster. COLOUR: antiqued bronze. cost as first item. This listing for 1 x 9mm Italian Charm with a WELSH FLAG on a SHINY finish base ***please read the full description BEFORE buying*** Remember to click ADD TO BASKET to ensure you always qualify for our promotions and SPECIAL OFFERS! Don't just click Buy It Now!. Color：Antique Bronze. I’m sure everything could be solved by communication. Size：17mm 29mm.